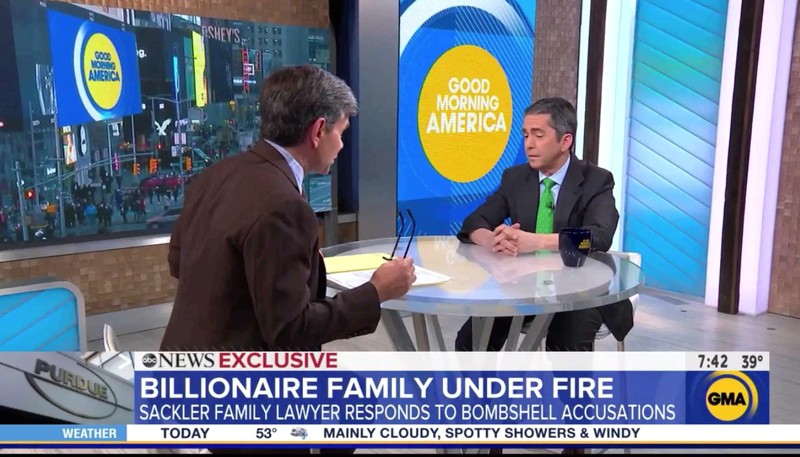 Behind the scenes of the cutthroat world of morning news, creating a unique look and feel for each show is key — and ABC News went big with a major on air overhaul for “Good Morning America” in a two-part project. 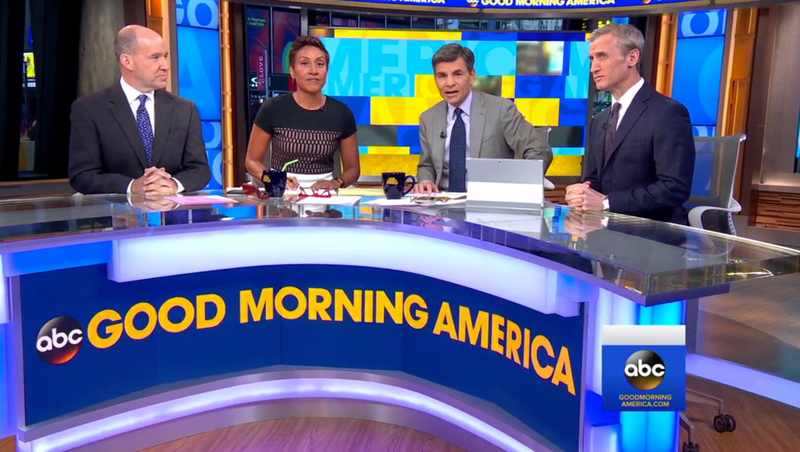 The new “GMA” set debuted April 1, 2019, was the second part of an on air overhaul that began with an updated graphics package that debuted in February. 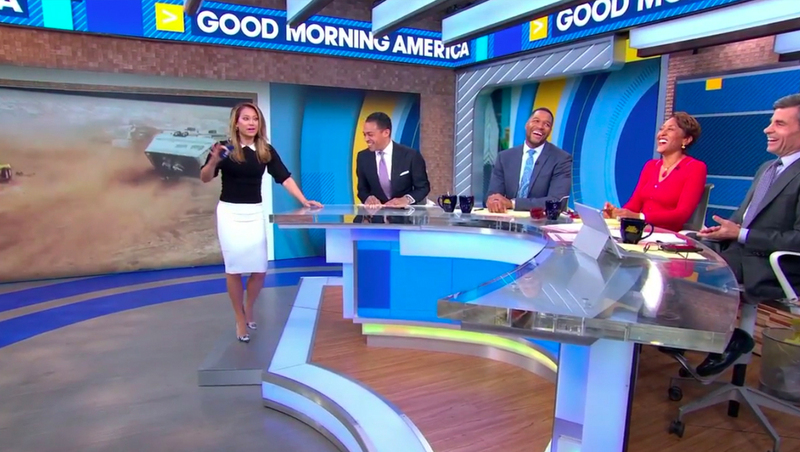 At the same time those graphics rolled out, “Good Morning America” already had finalized the design plans for a set overhaul that would follow about two months later. 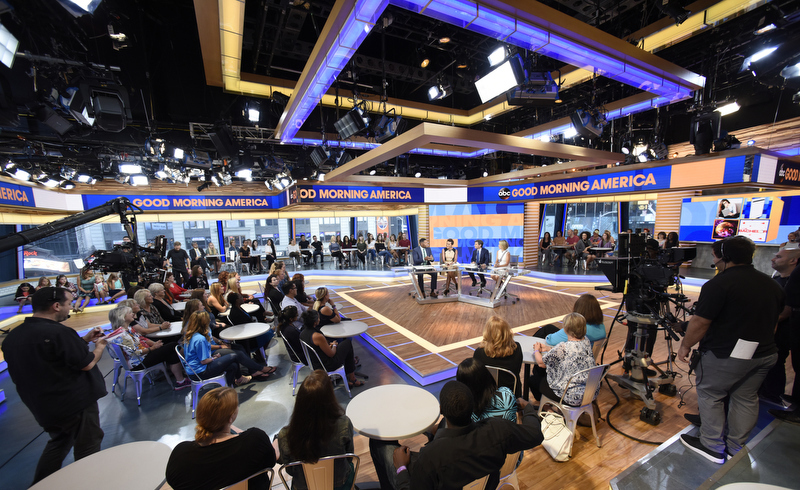 Seth Easter, who designed the new “GMA” set — as well as previous versions — started the redesign process in December 2018, with plans finalized in January 2019. “We wanted a refresh … that would fit with the new graphics package,” he explained to NewscastStudio. 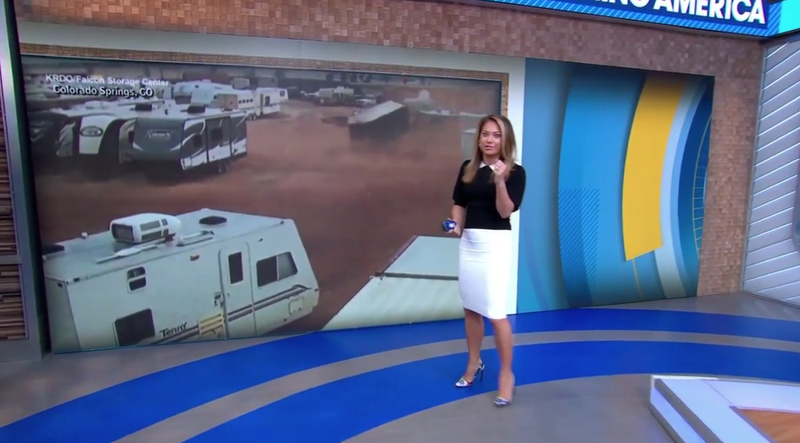 One of the biggest changes involved moving home base — a decision that gave the show more control over the background behind the anchor desk. “Moving it … gave us the flexibility to better control the overall composition of our singles and wide shots,” said Easter. The old ‘GMA’ home base. Previously, starting in February 2017, home based was located with its back to the studio’s streetside windows, though much of the view was covered by a large LED video panel. Prior to that, a video wall with a feed of Times Square fed to it served as the show’s primary background. 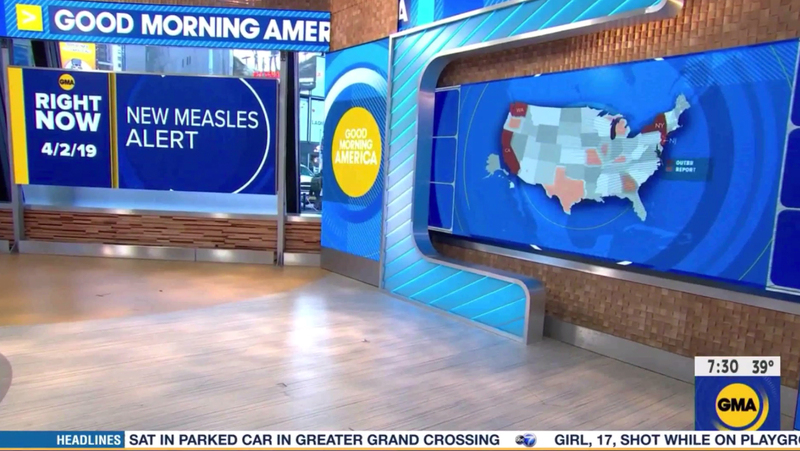 While the new anchor desk backgrounds — as well as those in other parts of the studio — can be changed out instantly thanks to the seamless LED panels used, Easter strategically integrated real scenic elements and textures mixed with graphics and layers of backlit set pieces. 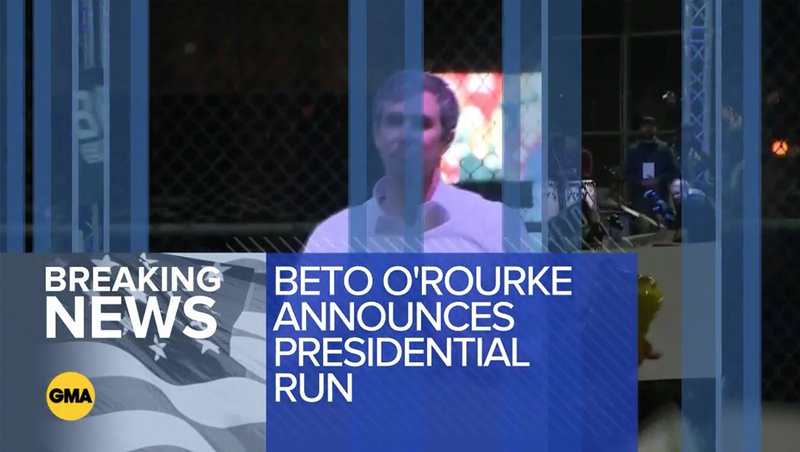 Combined, all of the video walls and structural features, including the “hallway” camera center behind the anchor desk also contribute to that layered look. Despite how it looks on air, that “hallway” is actually fairly shallow, said Easter, who lined up the internally lit upside-down Ls in this space to make it seem deeper. That alcove was created, in part, thanks to the unique footprint of the ground floor space this part of the “GMA” studio occupies in Times Square. Since the space wasn’t originally designed for broadcasting, the ceiling and grid height isn’t as high as in traditional broadcast studios, explained Easter, which makes strategic design choices key when planning for how the set is shot, especially in the wider views. The second floor set overlooking Times Square that ‘GMA’ also uses. He was also limited in what could be suspended from the set’s header and studio ceiling — elements that were a key part of his design for the second floor space in the same complex, which is home to the later portions of “GMA” as well as spin-off show “Strahan & Sarah” (originally known as “GMA Day“). Because of this crossover, the two spaces needed to complement each other — although they are both designed for different purposes. The downstairs area plays host to more traditional, enclosed studio with an anchor desk, multiple standup venues, interview area and a myriad of video panels for the show’s “walk and wander” and “video on video” shots that are used frequently to enhance storytelling. 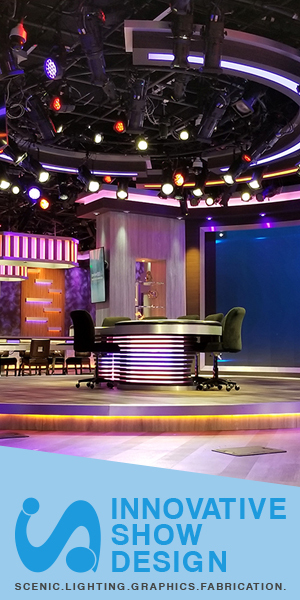 The second level features a higher, more casual desk that is used for roundtable-style discussions and can also be moved aside to create a larger open space surrounded by a studio audience that can accommodate anything from product demonstrations, cooking segments, mini fashion shows and more. 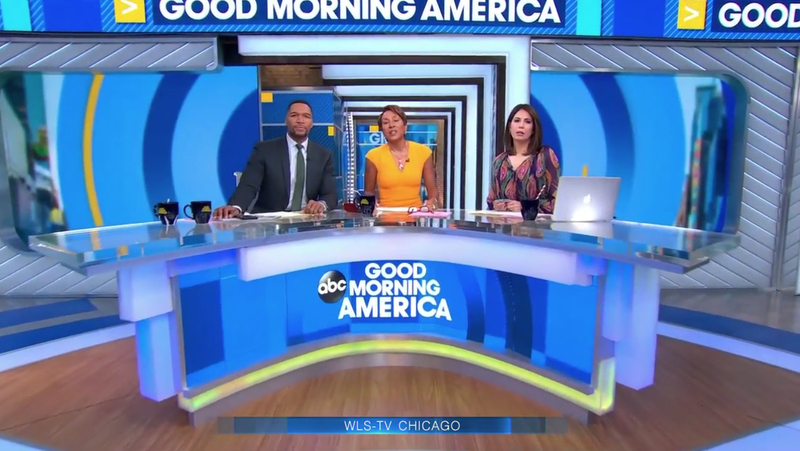 The new set was installed in phases over approximately one week, with “GMA” only completely vacating the space for one day — Friday, March 29, giving the design, installation and lighting team a long weekend to finish up work before the show went live from its new home on April Fools’ Day. Installation had to be carefully coordinated around the production of “Good Morning America” as well as to accommodate multiple vendors, craftspeople and other teams who worked on the project’s install before debut day. All told all of that hard work paid off, giving “GMA” a more flexible space with a unique look that also greatly expanded its storytelling opportunities. “I’m a big fan of the lightbox hallway and the rectangular headers above the anchor desk,” said Easter.